Andrew Jezic assisted me with a very serious felony case in Montgomery County Circuit Court. I was wrongfully accused of child abuse and neglect, and Andrew managed to shine the light of truth and justice onto the prosecution so that the charges were dismissed 3 weeks before the 7-day jury trial was to take place. Andrew is a brilliant lawyer who is determined to provide his clients due diligence and justice. Throughout the entire process, he kept me very well informed and involved with the details and events of the case. He clearly explained documents, hearings, motions and other protocol so that I complete understood what was going on. 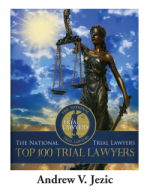 Although my knowledge of criminal proceedings and the judicial system is very limited, my opinions or suggestions were always part of the equation when dealing with strategy. Even though Andrew was steering the ship, I still had an equal share of control with the overall case decisions. When any bad news came about, he did not sugarcoat it, but rather explained the situation and how we were going to battle it. His work ethics and dedication to my case were incredible. The severity of the charges placed my case as a high priority for him and his staff who worked day and night, never missing a beat. Updates were made either by phone call, text or email at all hours of the day – which is something I truly appreciated. He and his staff were always professional, responsive and courteous. They were sympathetic to the fact that my stress and anxiety levels were high. They worked with me on a very personal level, treating me with respect and dignity rather than just another business client. I never felt like I was being judged or looked at sideways by anyone. I truly felt the entire staff wanted to help me win my case. Andrew is a devoted and vigorous attorney, who never ceased to amaze me throughout the case. Although I do not plan on having to hire a criminal defense lawyer ever again, if I had to, Andrew Jezic would be the man to call. I highly recommend him to anyone who needs a strong defense attorney in Maryland. I, Alex, last Saturday, June 1, 2013, was imprisoned in the detention center, Seven Lockes, in Rockville, MD for an accusation of sexual abuse of a minor, one of the most difficult criminal offenses to face. This nightmare destroyed my family and my immigration status. The penalty was 25 years in prison. I found this all to be very difficult even though I was innocent. But the big question was how to demonstrate and prove my innocence. I felt alone when I saw the letters from the court that read STATE of MARYLAND vs. ALEX. Well, in my search for a good lawyer to represent me, another lawyer recommended the firm of lawyers, JEZIC & MOYSE, LLC. Thank GOD I met with the lawyer ANDRES JEZIC. I could tell that he is a very intelligent and honest person. And, something that was very important to me, his experience with criminal cases made me confident and secure in my decision for him to represent and defend me. And all of his staff was attentive and calling me to find out if I had more information apart from what I first offered. They know how to use even the most minimal piece of information for my defense. Ms. Raquel Smith did an excellent investigation and the team made a good selection of witnesses for my defense. The entire investigation lasted for about 5 months; Raquel went to interview witnesses in their homes and in the office up until the day of TRIAL, which was scheduled to begin on Tuesday, the 12th of November, 2013 and last until Thursday, the 14th of November, 2013. But the trial was so complicated that it lasted one day longer than expected, finishing on Friday, the 15th of November. It was four very tense days, but I felt very confident with the Lawyers Andres Jezic and David Wooten, with the experience that they have. When cross examining the supposed victim, they got the truth from her without her even realizing, but the JURY did. Likewise, while questioning the prosecution’s witnesses, they scored points for my defense and the presentations to show evidence to the JURY. They used the material and equipment with etiquette and professionalism, and I will never forget this day, Friday, the 15th of November, 2013 when the JURY, gave their verdict to the JUDGE, and I heard the words “NOT GUILTY,” seven times, one after the other, there were seven charges against me. And this is how my nightmare ended, that, unfortunately, took over my life, but had a very happy ending. This is why I recommend the firm of lawyers, JEZIC & MOYSE, LLC. Thank you for recuperating my FREEDOM, May God bless you today and always. ALEX. Right when my family thought our world had ended, the law firm of Jezic & Moyse gave our life back just in time for the holidays. My husband was already sitting in jail for a month after being wrongfully accused of a felony crime. That if found guilty, he was going to do 30 + years. Unfortunately we started out with a non aggressive lawyer who asked my husband to plead guilty to a charge so that he would only do five years. While my husband was waiting in jail for sentencing day; our family and friends acquired the Jezic & Moyse law firm. They were successful in reversing the plea bargain and to start his case all over again. After nine months waiting for a new trial, that day finally came. My family and friends were very impressed in Mr. Jezic’s court demeanor and aggressiveness in defending my husband. After six days of hard work and determination of the entire law firm, my husband was acquitted of all charges. We thank the law firm for their dedication in returning my husband back to his family. If you are in need of a good, experienced, aggressive lawyer who is the best in town, my family fully recommends the Jezic & Moyse law firm. I was charged with 5 very serious criminal offenses. Andy Jezic gave me hope about the case which was brought to a closure after a very brutal 7 months experience. I was found NOT GUILTY of all 5 counts, and Mr. Jezic definitely was very instrumental to the verdicts. He was extremely thorough and very professional. I am so glad that I realized he had reviewed and read my case properly. 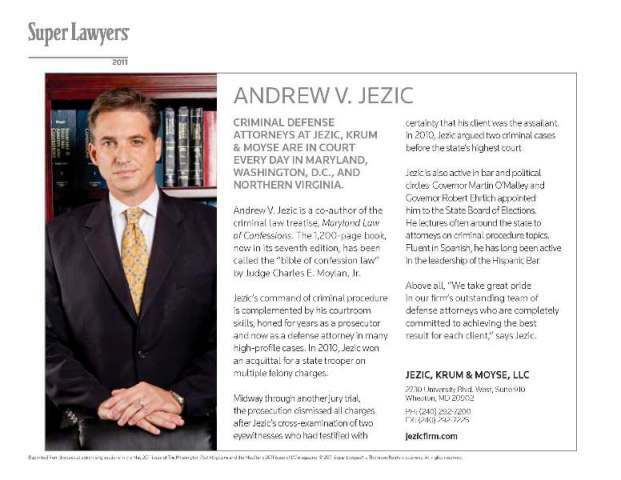 I highly recommend Andy Jezic’s firm any day because of their outstanding and tremendous job in and outside the courtroom regarding criminal cases. Mr Andrew Jezic handled my case for a series of serious Traffic charges. I could not have chosen a better lawyer to handle my case. I was very nervous and stressed when this incident happened, and I met a couple of lawyers but could not get the reassurance I was looking for, only Mr Jezic was calm, reassuring and he is the only one who really understood my dilemma and the impact this case could have on my job and my life. He is a thorough professional, very knowledgeable and very caring. 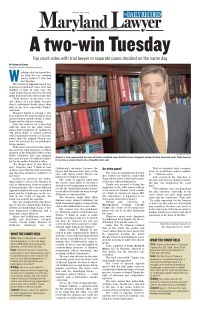 He treats every case with equal importance, be it a traffic offense or a more serious charges. He always replied to my text messages whenever I had questions and his assistant Nathalie was super helpful and supportive. His firm has a diverse mix of lawyers with knowledge of all aspects of the law, including immigration law, which was especially helpful in my case. Before the case i met him a couple of times and he patiently answered all my questions and reassured me. On the court date, Mr Jezic was calm, confident, and composed, he was able to get the best possible outcome for me. Even after the court case was over, Mr. Jezic, spent a long time in helping me fill all the required forms and explaining some of the legal procedures and implications. I am very happy with how everything was handled by Mr. Jezic and his firm. I will recommend this firm and Mr. Andrew Jezic to all. I am grateful for my experience with David Moyse. Throughout the entire process I felt as though I could trust his judgment in my case, and his guidance was very helpful to me. I trust his experience, his legal knowledge, his analytical capabilities, and his ethics. He encouraged me to be persistent and ultimately my case was dismissed. I can also appreciate that he took the time to communicate with my family and kept all of us on the same page. Although it was a difficult experience at times, I always felt like I was being taken care of so long as I followed his suggestions. It truly did pay off and I would recommend David Moyse to anyone. Sometimes no matter how good you are, how carefully you plan, or how normal your life seems – things can go wrong, horribly wrong. When our family faced a life altering legal crisis the attorneys at Jezic and Moyse were there for us in ways that are difficult to fully explain. We were facing felony charges, a long and complex legal battle, and a jury pool that likely knew of our case due to widespread media coverage. Over the next many months as we prepared for trial, Mr. Jezic, Mr. Moyse, Mr. Lucey, and many others in the firm, worked tirelessly on our behalf. Their hearts, minds, and souls were fully engaged in our defense. Their professionalism was matched by compassion and dedication. They are an amazing group of attorneys and some of the best “good guys” you will ever meet. I highly recommend them with no reservations. Right from the start, the Jezic firm impressed us with their efficient, professional manner – an approach that not only inspired confidence, but generated the results we were looking for. We needed an effective solution to our problem (serious traffic violation). Andy showed up at my door step on a “Sunday morning” to discuss. WOW! I can definitely say that I’d recommend Jezic firm to anyone. Andy’s firm provides superb customer service, from the time you walk in the office. Additionally, the team’s knowledge and communications was extremely valuable in our development of a successful victory. I can’t remember when I last sent a commendation to a company, but I have just been so impressed that I feel that it’s due. Initially I was very anxious and worried about my pending trial. Upon meeting Andy, I was much more confident that things were going to be okay. He gave me a pre-trial list of things to do to prepare for the trial. After completing the list, we got the outcome we were hoping for. Andy and Mr. Lucey are both very competent and professional. And I would definitely recommend the Jezic & Moyse Firm to anyone looking for legal help. My story is one of complete success, and a most desirable conclusion. I was facing a serious traffic infraction in Montgomery County. Upon our first conversation over the phone, David Moyse relayed a personal interest in my case. He was sincere, understood my concerns, and what was at stake with the charges at hand for me personally. The actions taken and plan devised by David in my situation resulted in complete exhoneration of the charges. Not only did he successfully argue and win my case, but he went one step further and assisted me in getting the charges expunged from the record. It is as if it never happened. I will be forever thankful and grateful for David’s counsel. I highly recommend him for any serious traffic infraction in Montgomery County. In August, 2009, thanks to Attorney Andrew Jezic, I can believe in American Justice System again. The trial was programmed for three days. On the first day, after Attorney Jezic’s opening statement and only two hours or so of interrogation it was enough to put an end to all the false accusations. With great knowledge of his field, professionalism and equanimity, Attorney Jezic put and end to my nightmare. Attorney Jezic’s firmness and consistent pressure to get to the bottom of the story and bring out the truth, brought the injustice to an end. This trial came to an end not by jury decision. It was brought to an end BY THE SAME STATE ATTORNEY, who recognized that the accusations were lies; therefore, all charges – all five – were totally dismissed. I was faced with 2 felonies and a citation in regards to vehicle manslaughter; facing serious time and life threatening outcomes. My family was devastated and so was I. I was set in front of a jury of 12 with Mr. Jezic as my counsel. He was fully knowledgeable of the law and how it operates, and gained the respect of the entire courtroom. Mr. Jezic captivated the jury of my trial by being extremely knowledgeable and devoted in my representation. His performance exceed my expectations and I am blessed to be found not guilty of all felonies. Not only was his professional performance great, but his ability to be a counsel and a honest-trustworthy friend and not just a lawyer for hire was one of the greatest benefits of all that helped my case, and his entire staff shares the same ethic. Hands down i couldn’t ask for a better lawyer and now a good friend. If i have any legal issues he will be my first call. Last year I was wrongly accused of a crime that could have ruined my life and reputation by going to prison for up to 10yrs. I went to a few different lawyers and never felt comfortable until I finally got referred to Andrew J. He was very down to earth and not judgemental of anything. He took the time to listen and I automaticly felt that he was on my side and had my best interest at heart. Money/fees didn’t seem to be the issue for him but instead just to defend someone that needed help. With his prosecution experience he was able to anticipate a lot of things which gave my case a great chance to be dropped. Finally my case was dropped and I was found not guilty of any of the accusations…. I always wish I never need a lawyer again but if I do, Andrew Jezic and his Team are the only lawyers I will hire. One of the best criminal defense attorneys I’ve met. Very knowledgeable about court law and he’s the best closer! His closing arguments deserve a standing ovation. Andrews’s legal team is also knowledgeable, very supportive and filled in when needed. I would recommend Mr. Jezic to anyone in need. I was once charged with a first-degree assault and incarcerated. Something I never thought could happen. Mr. Jezic collected all the documents and witnesses and persuaded the Judge to lower my bond from $350,000 to $0. In the end, I got probation before judgment (one-year non-supervised probation). Mr. Jezic saved my future life and my professional career. Mr. Jezic is very bright, knowledgeable, and experienced. He understands the justice system very well, and has good connections with prosecutors and judges. Mr. Andrew Jezic was exceptional in his representation of my criminal defense on a very serious felony case. I was facing decades in prison. He carefully reviewed my situation, conducted a thorough investigation, was always well prepared for the motion hearings, and he kept me informed at all times even on weekends and late evenings. He is indeed a charismatic, articulated, respectful, and most considerate professional who played an instrumental role in my very serious felony case. Thanks to Mr. Jezic’s exceptional professionalism and outstanding legal services, my case did not make it to jury trial and all the alleged charges were dismissed. I would definitely recommend him. Last year, I was falsely accused of a crime. I went to see Andrew Jezic and I immediately felt my case was in good hands. With a persistence of a court warrior, Jezic showed great skills to explain to the jury the injustice of the charge. His final statement was a masterpiece. The jury found me “innocent”, and my honor was cleared. Mr. Jezic is not only a great lawyer, but also a person who knows how to deal with the cultural issues that involve a Latino legal case. Mr. Andrew Jezic was extremely helpful in my situation after I was arrested several times over the course of a few months. I initially thought my life was over till I met Mr. Jezic and his partners as they proved to be very intelligent, knowledgeable, and productive when dealing with my cases. Not only did Mr. Jezic, Mr. Moyse, and Mr. Lucey give me the best possible advice and produce the best possible results for my cases, but they provided me with the support that I needed to deal with my convoluted situation. I would not be where I am today if it was not for Mr. Jezic, Mr. Moyse. and Mr. Lucey. Mr. Jezic was outstanding in winning my husband’s very difficult criminal case before a jury. He kept us very involved in our case and not only is he very dynamic, professional, smart and responsive, but he also has a great team of support staff and other partners in his practice. We were treated with respect and kindness at all times and he answered every question we had and helped us to cope with what has been the worst event in our life so far. I was indicted on five counts last year. If not for Andy Jezic and his partner, David Moyse, my family and I would have been devastated . Their honest, wise, and excellent legal advice and skill at the jury trial secured me an acquittal before a jury on all counts. Their defense was professional and aggressive. Thanks to his very professional handling of my case, my family and I had confidence in a favorable outcome. I give thanks to Mr. Jezic and Mr. Moyse!!! At a time when everything I worked for was on the line, Andy Jezic came through for me. Being a lawyer with an impeccable resume and great references, it was easy to put my trust in him. I never once felt the need to doubt him and I feel as if every penny I spent for him was worth it. My very serious felony case and all other charges were completely dismissed. I was indicted in a high profile case in which I was facing upwards of 56 years in prison!! 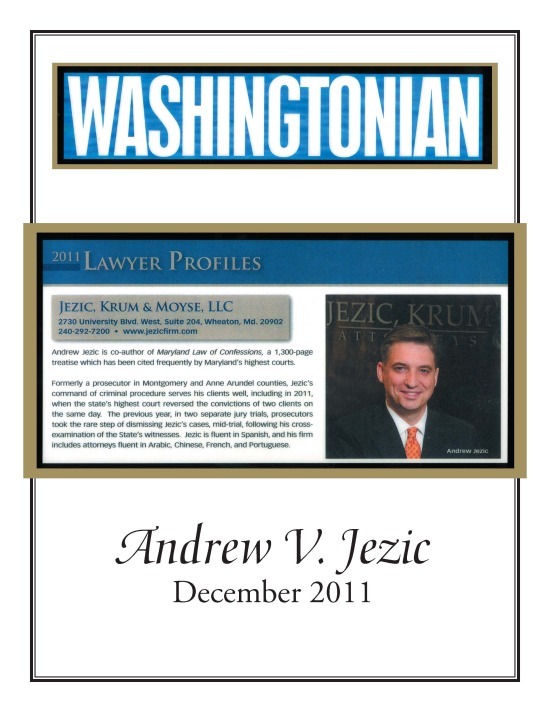 The lawyers at Jezic & Moyse made my entire family feel at ease and informed with every step of the long legal process. At several crucial stages of putting my defense together I was afforded the opportunity to have extensive consultations (2-3 times per week) with Mr. Jezic, Mr. Moyse, and Mr. Lucey, in order to review facts, statements, discovery, interviews and new lead confirmations etc. There attention to detail was extraordinary – initially I felt the reason I received so much attention was because my case was “high profile” . I learned quickly that they show the same concern to the father who was picked up for DUI or the mother whose son got in trouble with the law. The firm takes each case seriously and the best feature is the collaboration between lawyers – they provide expertise from several areas of law and utilize these skills to best serve the client. As a result of my experience with Jezic and Mose I have been cleared of all felony criminal charges, Mr Jezic also represented me successfully in three administrative hearing related to the criminal matter. As a result, I have been able to resume my professional career; my family and I deeply feel this would not have been possible and perhaps even my freedom would not be a reality without the diligence and hard work that the law firm of Jezic and Moyse provided. Last year I was wrongly accused of a crime that could have ruined my life and reputation by going to prison for up to 10yrs . I went to a few different lawyers and never felt comfortable until I finally got referred to Andrew J. He was very down to earth and not judgmental of anything… he took the time to listen and I automatically felt that he was on my side and had my best interest a heart… Money/fees didn’t seem to be the issue for him but instead just to defend someone that needed help… with his prosecution experience he was able to anticipate a lot of things which gave my case a great chance to be dropped… finally my case was dropped and I was found not guilty of any of the accusations…. I always wish I never need a lawyer again but if I do, Andrew Jezic and his Team are the only Lawyers I will hire. Facing two counts of 2nd degree DA, Andy worked with my family before trial to devise a solution that led to the charges being dismissed. More than a lawyer, he was a family counselor and friend during a tough time. Most definitely will refer Andy to others… his compassion is the difference.